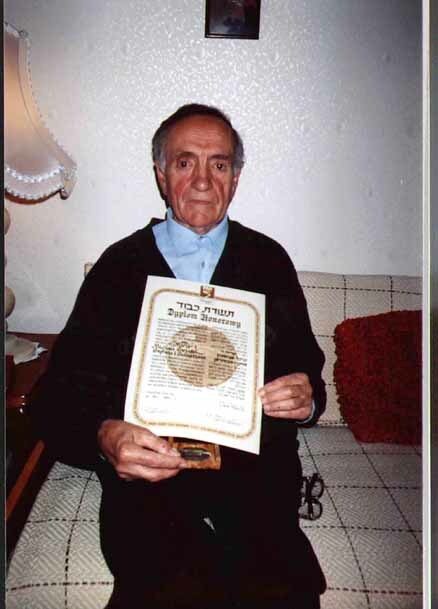 Stefan Swiatek holding Yad Vashem Certificate as a Righteous Gentile. Stefan is also a member of the Righteous of the World. He took an active part in saving the lives of many Jews from shtetlach near Kańczuga, including Bialoboki, Przeworsk, Zagorze and Gac. Howard Nightingale's older cousin Joseph Goldman was hidden by Stefan. He is in close contact with Stefan and often visits him in Poland.